Homemade sweet potato casserole made in the crock pot! No need to boil or use the oven for this delicious side dish. I love all taters but these just turned out perfectly. And did I mention how easy there were? No? Well, let me tell you. These were super easy! 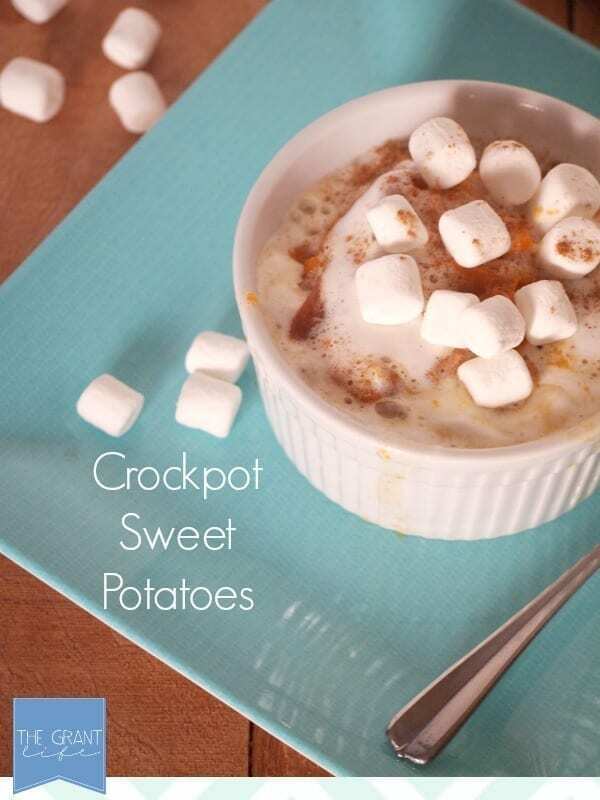 So take some stress off cooking the thanksgiving meal and try these crock pot sweet potatoes! I’m going to take a moment to just stare at the marshmallow-y goodness in that picture. Doesn’t it look amazing? I wasn’t sure how the crock pot would handle the marshmallows but it made them all ooey and gooey and delicious. I love a good savory side dish that is covered in marshmallows. You are going to need at least 4 large sweet potatoes, washed and diced. I didn’t peel my sweet potatoes but that didn’t seem to affect the flavor. I like my taters a little chunky so the extra texture didn’t bother me at all. If you want, feel free to peel your sweet potatoes first. For the brown sugar you need a 1/4 cup for the potatoes and then a tablespoon or so for the topping. Light or dark brown sugar both work great for this recipe. Don’t have any brown sugar? You can make homemade brown sugar in a pinch! Grab a bag of mini marshmallows as well. You can use large ones too. The only difference between these and oven cooked sweet potatoes is that the marshmallows don’t get crispy. Which I can handle seeing how I don’t have to turn on my oven, they take less time and they are amazing. 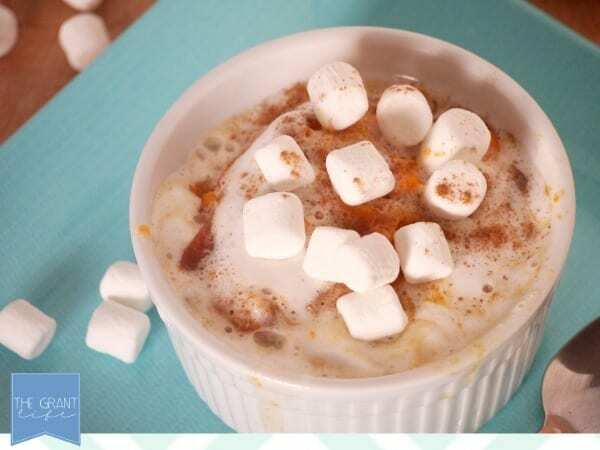 Any type of milk can be used in this crock pot sweet potato casserole recipe. I used almond milk and it gave the sweet potatoes a super creamy texture. Feel free to use whatever milk you prefer. Can I cook sweet potatoes in the crock pot? Short answer – yes! You absolutely can! This sweet potato casserole recipe uses diced sweet potatoes instead of whole taters. Check out this post on how to cook whole sweet potatoes in the crock pot. Put your cut potatoes in the crock pot followed by the brown sugar, pumpkin pie spice, milk and water. Give it a quick stir and set it on high for 4-5 hours. When the sweet potatoes are cooked, removed about a cup of the water/milk mixture and mash the sweet potatoes, if needed. 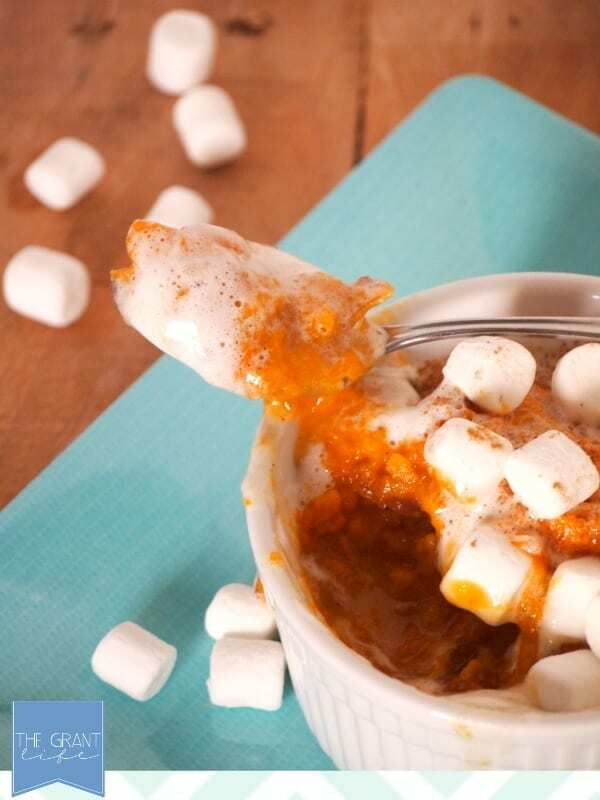 Turn your crock pot on low and add your marshmallows. Top the marshmallows with 2 tablespoons of brown sugar. Let cook for about 30 minutes, or until the marshmallows are melted. Turn off, let cool for a bit and serve. Put your cut potatoes in the crock pot followed by the brown sugar, pumpkin pie spice, milk and water. Give it a quick stir and set it on high for 4-5 hours. When the taters are cooked, removed about a cup of the water/milk mixture and mash the sweet potatoes. 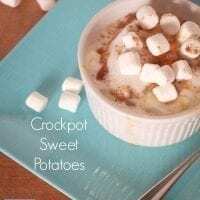 Turn your crockpot on low and add your marshmallows. Top the marshmallows with 2 tablespoons of brown sugar. Let cook for about 30 minutes, or until the marshmallows are melted. Turn off, let cool for a bit and serve. You can use any type of milk product. I used almond milk and they turned out great! Want more easy peasy recipes? Previous Post: « Calling All Bloggers! These look heavenly! 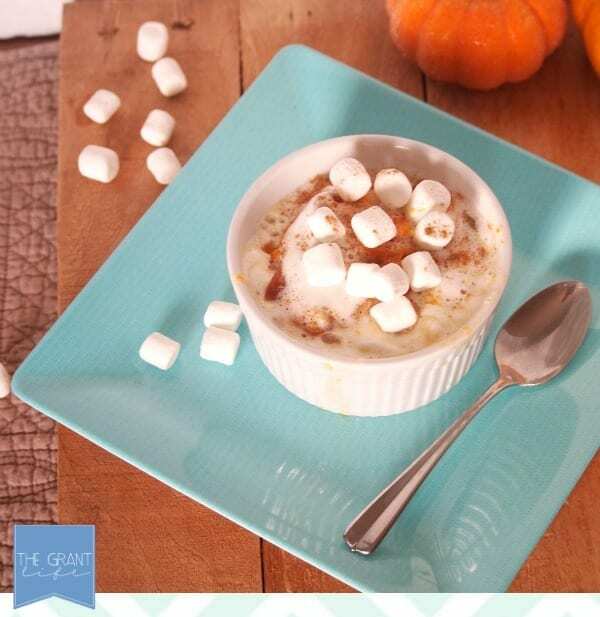 My husband loves sweet potatoes – I’m putting this recipe on our Thanksgiving menu right now. Seriously – I’m drooling. Yum! How much pumpkin pie spice would you recommend? I’m assuming you mean like a nutmeg? Hey Lynne! I probably used 1 or 2 teaspoons. Start with that and if you want more, add more. And yes! Pumpkin pie spice is nutmeg, cinnamon, ginger and allspice. Let me know if you have anymore questions. Happy Thanksgiving! This probably only feeds up to 10 people, depending on the size of your crock pot. Mine was a 5 quart and it was full of potatoes.